Are you overwhelmed yet? Don’t be. All business owners have been in a similar situation. This blog should provide you a roadmap on how to make the right match with a financial professional that best fits your needs. Let’s create a 3-step plan so that you can understand the relationship between all these terms and how to best manage your small business finances. The three most commonly used terms for accounting professionals are bookkeeper, accountant, and tax professional. Let’s dive into each one so you can better understand their role. If you want to watch a detailed explanation of what each professional does, check out my 8-minute video here. Responsible for recording company’s accounting transactions to maintain a real-time general ledger for current and future financial business decisions; may possibly be a trained expert in the accounting technology they use to record transactions (i.e. QuickBooks ProAdvisor). Analyzes and transforms the bookkeeper’s financial data into financial insights to discuss topics such as business performance and increasing profitability; may possibly provide additional services like tax planning and retirement planning, if qualified to do so. Prepares, calculates and files income tax returns on behalf of individuals and businesses; may possibly represent the taxpayer during IRS examinations, if qualified to do so. One common misconception is that the financial professional you are currently using, which is most often a tax preparer, is trained and qualified to do the work of a bookkeeper and/or a financial account. If those are additional services you require, you will need to research the professional first and then confirm that this professional provides the services required to fulfill your small business needs. That brings us to Step #2: identifying what accounting tasks need to get done. There are two important items to consider when evaluating which accounting tasks need to get done. The first is what needs to get done and the second is who is going to do it. Let’s cover each one separately. 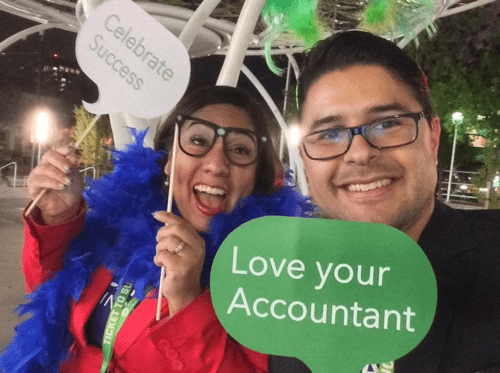 For a comprehensive list, check out the QuickBooks Blog Small Business Accounting Checklist and Infographic. Now you may be asking yourself: aren’t there financial professionals that do ALL three areas? The answer is YES, but they are usually larger accounting firms that have a staff of people that can assist in these very different areas. You may also find sole practitioners who provide all three services as well, but this is less common. For this reason, doing your research and then directly asking follow-up questions regarding a professional’s current services is very important. So let’s wrap this up with final step#3: find the financial professional that services your small business needs. Utilize online accountant databases like Intuit Quickbooks Find An Accountant: it has segmented financial professionals based on their services, expertise, and locations. Check out this 5-minute video on how to navigate so you can search like a PRO! Now that you understand what each financial professional does and have evaluated your own small business accounting needs, you can focus more clearly on the best fit for your unique situation. A recent Intuit, Inc. study stated that the odds for small business financial success go up by 89% if the small business works with an accounting professional. Let’s guarantee that you are part of this success statistic by making the right match for your business!